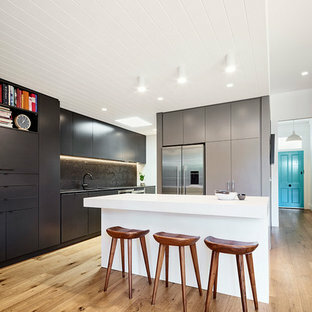 Photo of a contemporary galley kitchen in Melbourne with flat-panel cabinets, black cabinets, stainless steel appliances, light hardwood floors and an island. Inspiration for a contemporary teen room for boys in Brisbane with white walls and carpet. Contemporary galley kitchen in Sydney with a double-bowl sink, shaker cabinets, white cabinets, stainless steel appliances, dark hardwood floors and an island. 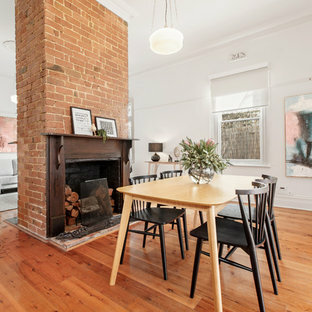 Contemporary open plan dining in Melbourne with white walls, medium hardwood floors, a standard fireplace, a brick fireplace surround and brown floor. 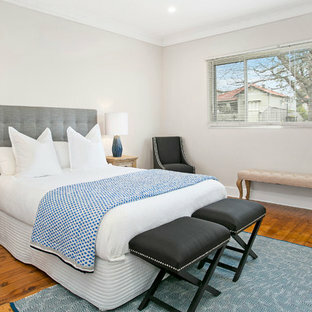 Design ideas for a contemporary master bedroom in Melbourne with white walls, medium hardwood floors and a standard fireplace. 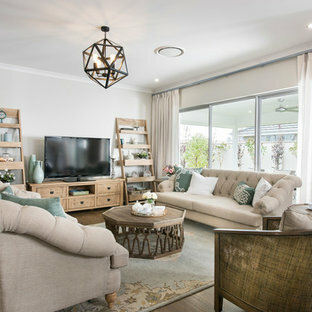 This is an example of a beach style living room in Perth with grey walls, medium hardwood floors and a freestanding tv. This is an example of a transitional dining room in Sydney with medium hardwood floors. 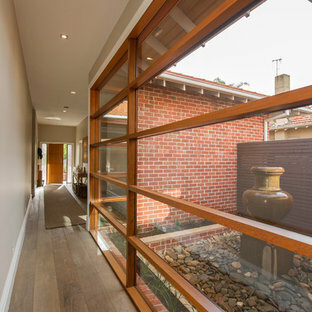 Design ideas for a contemporary hallway in Melbourne with beige walls and medium hardwood floors. This is an example of a contemporary living room in Perth with white walls, light hardwood floors and a wall-mounted tv. 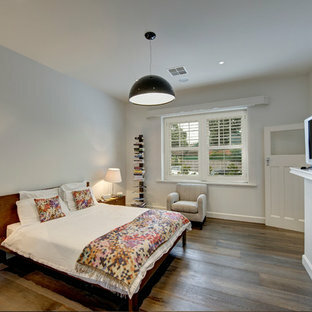 Inspiration for a large contemporary master bedroom in Perth with white walls, medium hardwood floors and brown floor. This is an example of a contemporary gender-neutral dressing room in Perth with flat-panel cabinets, dark wood cabinets and medium hardwood floors. Design ideas for a contemporary galley eat-in kitchen in Brisbane with a double-bowl sink, flat-panel cabinets, white cabinets, stainless steel appliances, light hardwood floors and an island. This is an example of a contemporary single-wall kitchen in Brisbane with a farmhouse sink, flat-panel cabinets, medium wood cabinets, black splashback, medium hardwood floors and an island. This is an example of a traditional study room in Canberra - Queanbeyan with beige walls, dark hardwood floors and a freestanding desk. Photo of a beach style family room in Sydney with multi-coloured walls, light hardwood floors and a wall-mounted tv. Inspiration for a mid-sized transitional guest bedroom in Perth with grey walls, medium hardwood floors and brown floor.